ANN ARBOR, Mich. -- University of Michigan football senior/junior linebacker Jake Ryan (Westlake, Ohio/St. Ignatius) is out indefinitely with a torn anterior cruciate ligament suffered in Tuesday's practice, the team announced today (Wednesday, March 20). "You always hate when anyone gets injured, and unfortunately we've dealt with our share of injuries in the last 12 months," said Michigan head football coach Brady Hoke. "We will support Jake to make sure he has everything he needs to get through this. I know he will attack his rehabilitation just like he does everything else and will be back when he's ready." 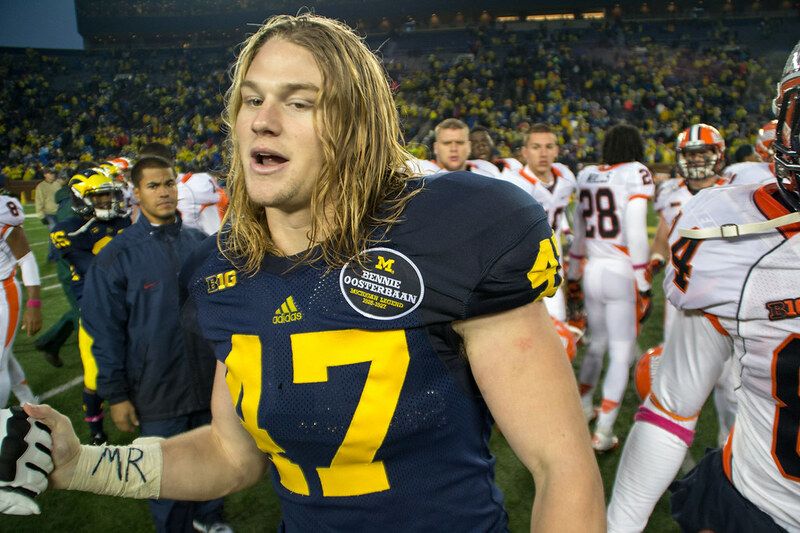 Ryan led the Wolverines in 2012 with 88 tackles, 56 solo, 16 stops for loss, 4.5 sacks and four forced fumbles. He earned All-Big Ten second team honors by the media and was the Roger Zatkoff Award recipient as U-M's top linebacker. Dating back to 2011, Ryan had tallied a tackle-for-loss in 17 of his last 19 games.